A new article in German about iRest and Senior Trainer Nöle Giulini's work in Europe! Join her upcoming German Workshops: The Practice of Welcoming - Weg durch Krankheit, Krise und Konflikt mit Nöle Giulini. Nöle came to yoga as a sculptor who moved from Germany to San Francisco in the mid 1980s. While attending the SF Art Institute she simultaneously deepened her personal yoga practice that had been a life-line to her through all these years in the new country. She has been teaching yoga now for 27 years. In 2003 she began studying with Richard Miller. Nöle is now a certified senior iRest teacher and trainer as well as a certification supervisor. Nöle developed a unique style that animates complex ancient teachings in a playful, practical, and deeply life changing way. It is this gift – received and given--to live the coming together of the creative and the spiritual- that is the heart of her teaching. She teaches in Germany as well as the US in both languages and is planning to offer the first Level 1 Training in Germany in 2017. Attached you will find a German language article Nöle was invited to write for Impulse Magazine about her workshops in Germany.It speaks of how the “I” as “appropriating mechanism” attaches itself to our perceptions and then claims them. It describes how a sensation, a feeling, an emotion or a thought is a messenger that is delivering a precious “gift” that yearns to be unpacked and received. 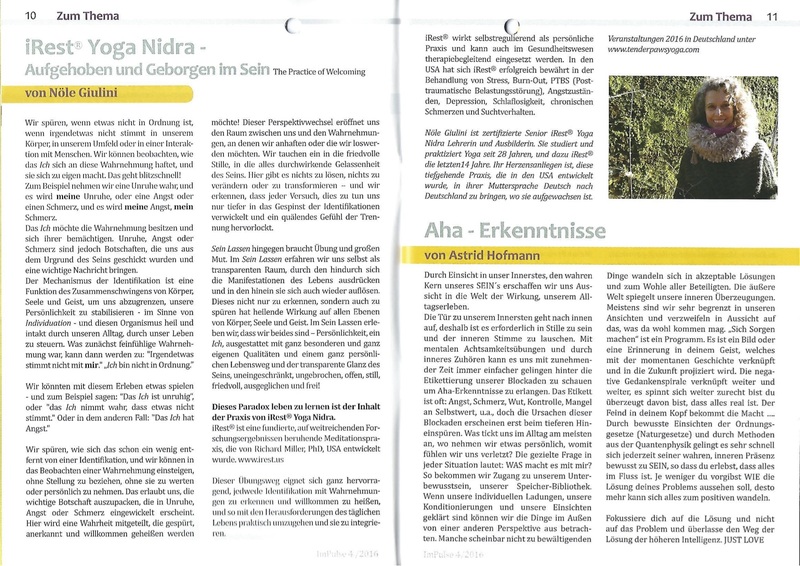 The article also contains the dates and locations of Nöle’s offerings in 2016 in Germany. In the IRI website store you can also find her recording of her translation of Richard Millers “iRest at Ease” (“Gelassen mit iRest”) as well as live recordings from guided iRest practices during her workshops in Germany for downloading.